This document shows how to ensure your SAP ERP as well as other business critical applications work the way you need them to and obtain an excellent ROI regardless of where they are hosted. Many enterprises take advantage of SAP Enterprise Resource Planning (ERP) to run their business. SAP ERP consists of several modules, including utilities for marketing and sales, field service, product design and development, production and inventory control, human resources, and finance and accounting. SAP applications are as ubiquitous as they are mission critical. Capable of coordinating resources, information, and the activities needed to complete a range of business processes, it’s not hard to understand the appeal of SAP ERP. The tools are powerful and can help improve a business’s efficiency and performance. 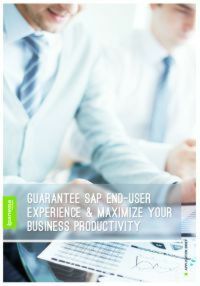 Enterprises must be prepared to protect the powerful capabilities of SAP ERP and guarantee the end-user’s experience to maximize business productivity. 7 Vorgehensweisen für Datensicherheit in Office 365 und Co.